Hot Air Review Rises To The Top. Last weekend just might have been the most stacked couple of days for local album releases in years. On Saturday, nearly 800 attendees packed themselves inside Granada Theater to catch a glimpse of the frequently buzzing A.Dd+ performing cuts off their long anticipated DiveHiFlyLo mixtape. Just one day before, though, KXT favorites Air Review were releasing a highly sought-after album of their own. It was a weekend many writers and scenesters have already been calling Dallas hip-hop's coming out party, referencing not only A.Dd+'s show, but also Dustin Cavazos' cookout and a charity basketball game in which many DFW hip-hop artists participated, too. As such, everyone from Tunk, -topic, Tum Tum and Brain Gang caught tons of shine this week, in addition to the aforementioned A.Dd+ and Cavazos. Still, though, others wrote pieces which cited events like Red Bull's Thre3style and the number of extremely well-attended weeklies by local DJs, saying that 2013 also will eventually become known as the year in which DJs became the new Dallas rock stars. 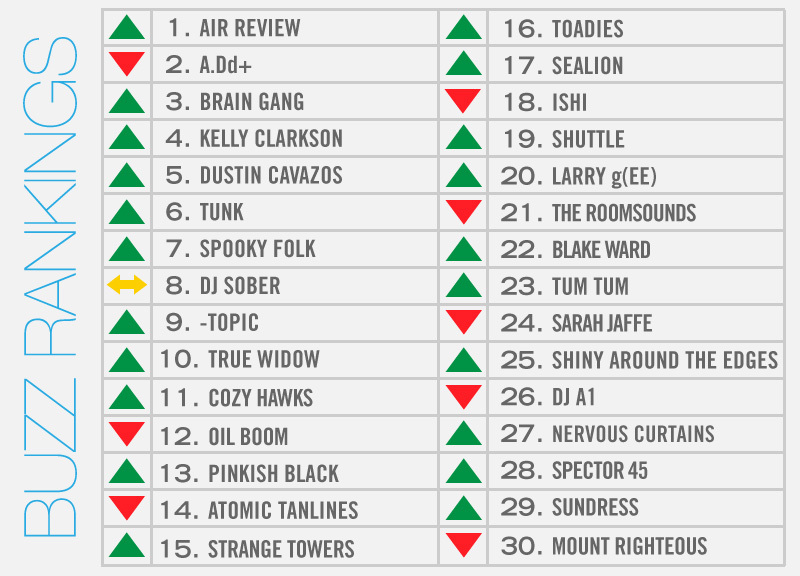 Not surprisingly, three of the city's best record spinners, DJs Sober, A1, and Blake Ward all made this week's list. Ward's birthday bash at Beauty Bar even saw his regular slot taken over by his nationally adored DJ pals Spank Rock and Shuttle. Somehow, though, through all of this, Air Review's sophomore full-length proved itself a much-lauded effort worthy of the praise it garnered in nearly every local publication this week. And, y'know what? We tend to agree. Low Wishes is a watershed moment for tastefully incorporating electronic elements into the band's already delicate indie-folk arrangements, and without sounding the least bit overbearing. Elsewhere, Kelly Clarkson and Jewel released a weepy, albeit widely praised, reinterpretation of Jewel's “Foolish Games,” which is set to appear on her upcoming greatest hits album. Also, local favorites Spooky Folk released their first new track in three years, Cozy Hawks are playing their first show in months, and Denton's Strange Towers are slated to make their Dallas debut. Maybe this week was more than a watershed moment for Dallas hip-hop, after all. Maybe it was just a great week for Dallas music as a whole.